"The guilt of feeling grateful to be alive is heavy." Thus begins a poem by Pulse shooting survivor Patience Carter, who wrote the poem while recovering in the hospital. It paints a vivid picture of the pain of survival and coming to terms with what happened. The shooting at the Pulse nightclub, a gay club in Orlando, was the deadliest shooting in American history, killing 49 people and injuring 53 more, including Patience Carter. Carter, who is from Philadelphia, is a student at New York University but was living in Orlando for the summer while working as an intern at Fox 29. During the shooting she was trapped in a bathroom for several hours with the gunman, and was shot in the leg but survived after SWAT entered the building and ended the standoff. One of the two friends with whom she went to the club, Akrya Murray, died from her injuries. Carter read the poem about her experience aloud for reporters two days later from the hospital where she was recovering, explaining that writing was part of her healing process. The poem, which Carter has not titled, describes the difficulty of surviving and of coming to terms with the events of that night. Since speaking publicly about her story, Carter has been besieged by conspiracy theorists who believe the shooting at Pulse never actually happened, and that Carter is a "crisis actor" — a term used among conspiracy theorists to denote someone paid by the government or the media to pretend to be the victim of a staged crime. Many people online have made much of the fact that Carter is an intern for a local Fox affiliate, and been generally insensitive. Carter, however, does not seem overly bothered by the trolls. In an Instagram post the day she was released from the hospital, she not only thanks the hospital staff, her friends, and her family, but also the people who doubt the truth of her trauma. "[Thank] you to all the skeptics that believe my pain isn't real, it's your outrageous insensitivity that makes me want to heal even faster, and grow even stronger," she writes. 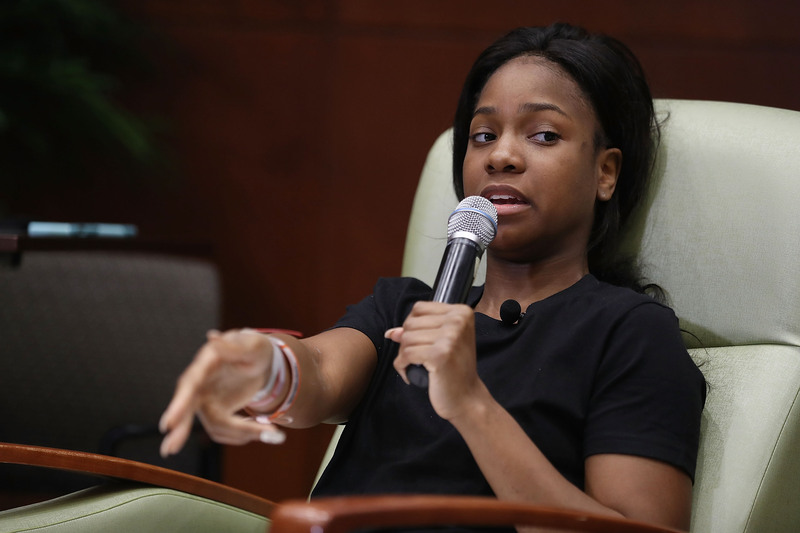 Overall, Patience Carter seems like a remarkable young woman, and some who, along with all the other survivors of the Pulse shooting, deserves our support.